It’s been said that you can learn a lot about someone by how they handle adversity. Some people crumble while others remain calm when faced with in a difficult situation. What follows is the story about how I was cool as a cucumber during on of those times. 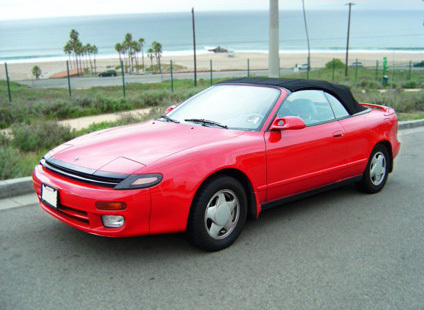 My girlfriend in college had a red Toyota Celica convertible that she called, Cellie. She could often been seen cruising around town with her friends with the top down on Cellie, while Prince’s “Little Red Corvette” blasted through the speakers. We had traveled from Florence, Alabama to visit her family in Fairfax, Virginia for a few days. She was driving on our way back when we got pulled over somewhere in Tennessee. I asked her if she was speeding and she said she was, so I figured she’d get a ticket and we’d be on our way, but it wasn’t long before I realized this wasn’t going to be an ordinary traffic stop. I was taken aback when the officer came to her side of the car and asked her to step outside. She closed the door behind her and I couldn’t really hear what was being said. The next thing I knew the officer was leading her back to his car and she got inside. Ummm, why is he coming back to the car? My first thought was that she must have had old, unpaid tickets that finally caught up to her. I started thinking about how I was gonna have to follow them to the jail so I could bail her out. I was so lost in thought that I didn’t see the officer coming back to the car until he was knocking on my window. Because my girlfriend had turned the car off, I couldn’t roll down the window so I opened the door. 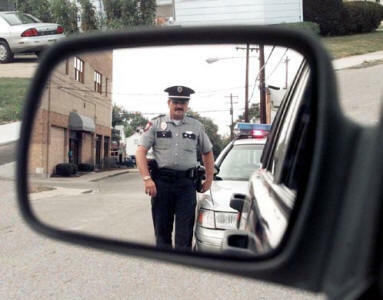 Officer: Would you mind getting in the back of the car with your girlfriend? My mind was racing as we silently walked toward his car where he opened the back door for me to get in. I saw my girlfriend nervously sitting the back seat as I slid in while the officer closed the door behind me. This is the point where I could have lost my cool and started questioning my girlfriend about what she had done to put us in this predicament. Yup. Those were the first words I said to my girlfriend while we were sitting in the back of a police car for unknown reasons. My girlfriend’s mouth flew open and her eyes got big as she let me know that she had NOT farted. Girlfriend: He thinks we have drugs in the car. Me: You don’t, do you? Girlfriend: No. But I don’t know if my friends could have left something in there or not. Me: Are you SURE you didn’t fart? Me: Damn, it smells like somebody took a crap in here. While we were having our fart conversation, I noticed the officer had opened up the trunk and was looking around, but not touching anything. A few second later he closed the trunk and was walking back to the car. We sat in silence as he closed the door behind him and started fumbling with something in the front seat. We heard a click then heard a familiar conversation. Me: Then there’s nothing to worry about. He stopped the tape recorder and got out of the car and opened the door so my girlfriend could get out. I slid out of the car and followed my girlfriend to her car. Turns out he pulled us over because he thought her car looked like it could be “drug running” car. Apparently the state of Tennessee was trying to crack down on people bringing drugs from the east coast. My first thought was if we WERE smuggling drugs then you better damn well believe that we’d be doing the speed limit and not one mile over it. But the one thing I couldn’t get out of my of mind my was what that officer was going to think when he rewound the tape and heard me say his car smelled like someone took a dump in it. Thankfully he didn’t pull us over again. Gallery | This entry was posted in Daily Life and tagged daily life, Flashback Friday, humor, postaweek2012. Bookmark the permalink. LOL! I hope he did hear that whole conversation. Serves him right for driving without air freshener.